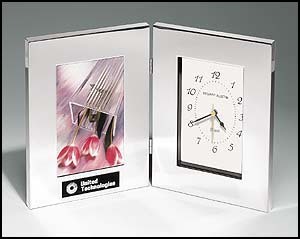 Combination Clock and Photo Frame in Polished Silver Aluminum. 6.25 x 8.25 x 2 inches. (12.5 inches in open standing position) Photo size 4 x 6. Laser engraved plate included. Batteries included. Great gift for anniversary, retirement or any recognition event.